Have You Tried Quizzes For Increased Visibility? Lead generation is tough work. Yes, I’m going to just say it right out: It’s hard! But it doesn’t have to be that way. Have you ever seen one of those quizzes from BuzzFeed during your Facebook scroll? 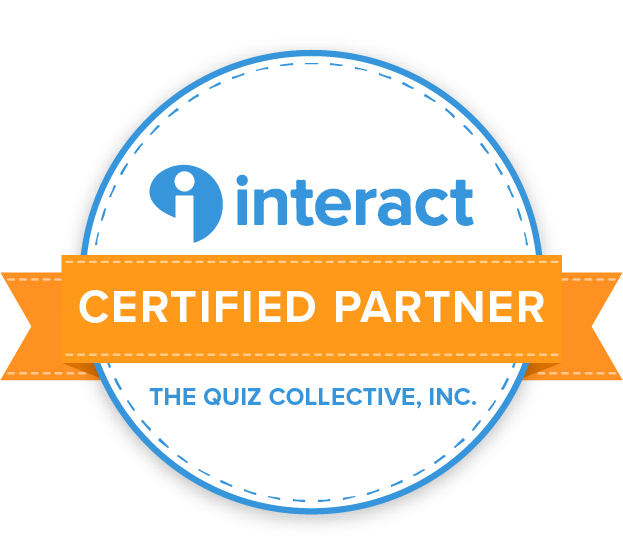 Well, I’ve had the awesome opportunity to partner with Interact to create a quiz that does just that: Awesome lead gen! Through some trial and error, I found a topic that people liked. My initial quiz was titled, “What’s Your Brand Personality,” but I found very quickly that people were dropping off after the first or second question. So I went back to the drawing board. This is one of the things I love about working on visibility and lead generation. Sometimes the thing YOU think works doesn’t. You have to keep testing and refining as you go along. I looked at my questions and tossed out roughly half of them for things that are more fun. Remember, if you want to connect with others, ask them about themselves and make it fun! I renamed my revised quiz, “What’s Your Secret Sauce?” and started seeing results almost immediately. I find that a lot of women entrepreneurs fail to see their unique contributions to the world. They underestimate that magical “special sauce” that only they can offer their clients and customers. With this quiz, I really wanted to answer that question for them right away. Interact Quizzes are SO simple to set up. Really, the hardest part is writing your content. When you create a new quiz, you begin here. Since it was my first quiz, I decided to use a template. There are quiz templates for everything from automotive to blogging, entertainment to home and garden. I really feel like there’s something here for every industry. Scrolling down, I found a template section for marketing. Clicking on that, I then moved to the next step: choosing what type of quiz I wanted to build. I chose “Personality,” and then was presented with another screen full of suggested quizzes. You can totally use the quizzes as-is or modify them to suit your business. Obviously, I suggest you choose the latter and personalize it to your business and your ideal customers. Once inside, I customized EVERYTHING! Here’s a look at my cover page in editing mode. Notice I picked a cover image and changed the colors to my brand’s style guide. I also added my logo in the bottom right corner. This cover image is what people see when the go to the quiz directly. It’s also in the popup window on my website. At this point in the process, it’s so tempting to just start playing around and writing your questions. While I encourage the exploration, hang tight for a bit if you can. I worked on my questions separately, writing them out in my journal and then typing them up in a Word document, each time looking at the wording and making sure it was as easy to understand as possible. This quiz has 6 total questions, which is right in the middle of the ideal number. Interact suggests making quizzes 5-7 questions long so people don’t lose interest and quit early. I chose to go with fun, lighthearted questions for a couple of reasons. For one, people respond to positively-geared questions about themselves. They want to tell you all about their coffee preference, an ideal concert, or their favorite comic character - if you make it easy for them! And for another, it’s aligned with my brand. Would I suggest the same thing for a tech company? No, but I’m not a tech company. So, I’d suggest you pick a tone for your questions that’s in line with your brand voice and brand story. As I said before, my results were narrowed down to three options. I love the option to show a call to action button here! For this quiz, I opted against it, but in my future quizzes, I’m going to play along with it a bit. For this quiz, I also didn’t require an email opt-in to see your result. The CTA here at the result page would be perfect for picking up some extra leads from those who didn’t opt-in via email. Again, I’ll be testing this function for my next quiz. There’s also an option to auto-redirect people to your website for results. This is a fantastic feature because, ultimately, you want people getting to your site. Before you’re ready to publish your quiz, take some time to map the results to different email lists. This helps you really aim people at content based on their result. I use MailChimp for all my newsletters, so that’s the system I used here as well. It’s super simple to use, especially if you’re familiar with MailChimp. As you can see, my results all went to different lists, which I love! Integrating the quiz into your website is even easier than integrating it into your email system. Just click Share/Embed to access these options. Now, it’s important to note that I’m not pushing this quiz online too much. I ran a small Facebook and Instagram ad campaign to test things out. That said, let’s chat analytics. I highly recommend turning on your analytics. You get to check out how many people view the quiz, start, complete, and actually put their email into your quiz. You can see I’ve got a conversion rate of about 18% which isn’t fabulous. For some reason, about 20% of people are dropping off at the first question. This isn’t necessarily a bad thing, though. My first question is going to weed out men - they’re not my target audience - and likely to weed out younger viewers. Over the past week, I’ve gotten six new leads. For me, leads are about quality, not quantity. I’d rather have these 6 leads be quality, engaged potential clients than 106 new leads that just let my email languish in their inbox. After revising my quiz a couple of days ago, I’m getting at least one new lead a day, with very little promotion or work on my end. Since it’s not the only source of my lead gen, I’m happy with this. For my next quiz, I’m going to expand my funnel strategy to see if I can keep people engaged throughout and get more completions. Honestly, I love this platform and I’m excited to be an Interact Certified Partner. Like so many strategies in increasing your visibility, it takes time and trial and error to get things right. Interact Quizzes aren’t magic. They won’t just work with minimal effort. Even with a good amount of work, you’ll need to do some tweaking. If you go into it with that expectation, then I think you’ll love it too. I wouldn’t suggest this as the only source of lead gen, but it’s a great way to add another element to your overall marketing and visibility strategy. When setting up your quiz, don’t be afraid to change things up and revise as you go along. Take the lessons you learn from your first quiz and make your subsequent ones work better. Ready to get started? Use my affiliate link here. Stay tuned for my follow-up post to learn how I’m taking the lessons learned here to create a better quiz and get even more leads!